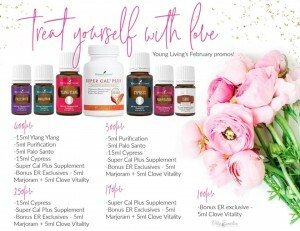 FALL IN LOVE WITH FEBRUARY’S PV PROMO and check out this SWAY link that describes uses for EACH free oil!! Show some love to your mind, body, and soul by improving your whole-life wellness with our PV promo. With your qualifying order, you’ll receive a 5 ml bottle of Purification® and a 15 ml bottle of Ylang Ylang. Use Purification to help freshen your favorite date-night frocks and complete the look with glowing skin by adding a drop or two of Ylang Ylang to your face lotion. Dilute drops from your 5 ml bottles of Palo Santo and Marjoram with carrier oil to give tired muscles some TLC. After massage, meditate while diffusing Cypress and surround yourself with the grounding aroma. You’ll also receive Super Cal™ Plus and Clove Vitality™—products that help you care for yourself from the inside out. Check out this month’s products!